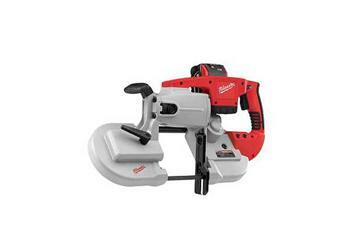 The Milwaukee 0729 Cordless M28 Portable Band Saw uses a high powered Milwaukee built motor to deliver optimal cutting speed and performance. Powering the 0729 is the revolutionary 28 Volt LITHIUM-ION battery pack exclusively from Milwaukee. The 28 Volt battery pack delivers two times the run-time as most 18V products, expanding the list of tools that can be driven on this platform. The battery is positioned so that the balance and line of sight to the cut are not compromised. This band saw has the deep cut capacity of 4-3/4 in. x 4-3/4 in., which makes this tool extremely versatile and productive. The variable speed trigger delivers optimal cutting speeds of 0-225/0-350 surface feet per minute. The LED light aids in making cuts in dark places. A comfortable non-slip soft grip handle offers a better gripping surface and reduces operator fatigue. Capacity in Rectangular Stock 4-3/4 in. x. 4-3/4 in. Signup for news and specials.